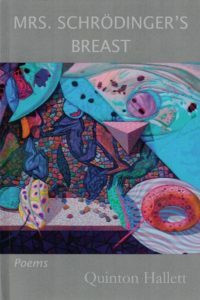 Mrs. Schrödinger’s Breast is one of the most complex and carefully layered collections of poetry that most of us will ever read. I wondered, when I saw the title, whether this was a feminist restatement of Woody Allen being chased over the cinematic hills by a forty-foot mega-mammary. Hallett has a spiky sense of humor (in previous collections she asked Joan of Arc “what’s at stake” and had scientist Rosalind Franklin refer to DNA Nobelists Crick and Watson as “that base pair”), but I could not see her devoting poetic energy to such a project. I then speculated whether Hallett, a noted gold-panner of human subtlety, had found some connection with physicist Erwin Schrödinger, whose hypothetical Cat that can be assumed simultaneously dead and alive has become well-known. Yes, it’s that Mrs. S., one Anny, apparently a woman of social vigor and marital flexibility. The poet’s connective tissue, set forth with glowing clarity in a short, moving “Afterword,” was her own potential cancer. This collection is built around potential: that which may or not be. A more macabre or less serious poet might have called the collection Cat Scan. What Hallett has done is build a triple helix of her own experience, the life of Anny, and the theories of Erwin. This allows her to use the device of Erwin Schrödinger’s uncertain Cat, particularly for the many poems that are part of the main themes. We not only follow the unique circumstance of waiting for news of a biopsy in “Deadlock,” but we find frequent visions in these poems – sometimes in the path, sometimes in the mirror – of alternatives: things that may or may not happen, or exist. Let’s look at “Deadlock” in its entirety. What weight on two words and a symbol: Results = Pending. These words are the mirror image of the Cat That (Is/Not) Dead, reflected inside the poet’s body. Results = Pending carries the weight of the potential of cancer on a yin-yang fulcrum – an equals sign, less than a word but in this poem so much more – in the center of the poem. The discerning eye might add a flickering arrow pointing each way. This is poetic art at the highest level. It is the considered benchwork of a master crafter. Like a maker of swords, she adds how many layers? How many folds? How much flex here, and there? How many directions or outcomes? What will cause the balance to shift one way or another? I can’t help but think of James Merrill’s masterpiece “The Country of a Thousand Years of Peace,” in which … the sword that, never falling, kills … hangs over the bed of his friend, the Dutch poet Hans Lodeizen, whose pending death everyone in the room notionally denies. How many of these poems are really about the mammiform protuberance in question? The answer – the uniquely suitable and beautifully surprising answer – is: it depends. It depends on the reader, in some cases. We find what we wish to find or are capable of finding. I may find something you do not, and vice versa. Hallett has always been a master of experience-oriented, multi-layered human life, both daily and profound. Here, we have at least two stories running simultaneously through a sizable, varied, and robust assemblage of poetry. Included is a series of poetic miniatures that refer more or less expressly to the titular breast, as well as some larger works. in marital architecture with Erwin and Hilde. She/they are jealous or not jealous. there is no possibility of betrayal. Mrs. Schrödinger’s breast has no standard cup size. Handful or sweaterful, a more fitting gauge. if volume is ever to be increased or diminished. This particular poem recalls the late Hannah Wilson’s poem “The White Sweater” about a long-gone sweater that once may have overemphasized teenage breasts, but now, if replaced, might fit again because those breasts have been removed. Wilson, a friend of Hallett’s, was my high school English teacher forty-odd years ago: a circle quietly closes. There is more to this collection than Anny Schrödinger or allusions to her husband’s invisible feline. When I first read through it, I thought perhaps all of the Schrödinger material should be in one section and all of the unrelated poems in another. Yet what, after all, does “unrelated” mean? We see many connections; some we may not see. A few of the poems have a somewhat more casual feel to them, but a couple that seem a little too light at first develop a Merwinesque tone on careful re-reading. In these more delicate poems, there is someone in the whispering gallery; the ferns move in the breath of no wind. The collection includes poems written in a variety of layouts – I’m not sure “forms” is quite the right word in this context. The collection begins with “Self-Portrait as a Bruise,” a poem that is not really part of the core “story” of the collection (or is it? ), but which is such a precise, tightly wound coil of meaning that I will close with its last six lines here. (You’ll have to buy the book for the full experience.) This poem is one of Hallett’s all-time best, a garnet mine of meanings and ideas compressed into a single work. and pools with me in one place far too long. Quinton Hallett has always found good stories about us, as people, to share via her poetry. That’s true of many poets. Few take such care in folding their word-layers to make swords worthy of the title craft master. Such work is revealed to us in Mrs. Schrödinger’s Breast. Did I see St. Julian of Norwich, patron saint of cats, leaning down from her stained glass to have a closer read? Maybe. Felis ex Machina. Also by Quinton Hallett: Refuge from Flux (2010), Shiver, Quench, Slake (2004) and Quarry (1992).